Marlins Park is the site of the matchup between the Philadelphia Phillies and the Miami Marlins on Tuesday, July 18, 2017. The probable starting pitchers are Vince Velasquez for the Phillies and Adam Conley for the Marlins. Philadelphia opens at +126 while Miami opens at -136. The Phillies have a 40-43-7 over/under record and a 45-45-0 run line mark. The Marlins are 47-43-0 against the run line and have a 48-36-6 over/under record. The Phillies have a 30-60 overall record this season. Starting pitcher Vince Velasquez has a 2-5 record with an earned run average of 5.58 and a WHIP of 1.46. He has 53 strikeouts over his 50 innings pitched and he's given up 52 hits. He allows 9.4 hits per 9 innings and he has a FIP of 5.26. The bullpen has an earned run average of 4.48 and they have given up 295 base hits on the year. Teams are hitting .255 against the bullpen and they've struck out 283 hitters and walked 123 batters. As a team, Philadelphia allows 9.2 hits per nine innings while striking out 7.7 batters per nine innings. They are 23rd in the league in team earned run average at 4.65. The Phillies pitchers collectively have given up 820 base hits and 413 earned runs. They have allowed 127 home runs this season, ranking them 6th in the league. Philadelphia as a pitching staff has walked 289 batters and struck out 686. They have walked 3.3 men per 9 innings while striking out 7.7 per 9. They have a team WHIP of 1.39 and their FIP as a unit is 4.69. As a team Philadelphia is hitting .241, good for 27th in the league. The Phillies hold a .395 team slugging percentage and an on-base percentage of .304, which is good for 27th in baseball. They rank 25th in MLB with 8.2 hits per game. Odubel Herrera is hitting .262 with an on-base percentage of .298. He has 89 hits this season in 340 at bats with 33 runs batted in. He has a slugging percentage of .421 and an OPS+ of 88. 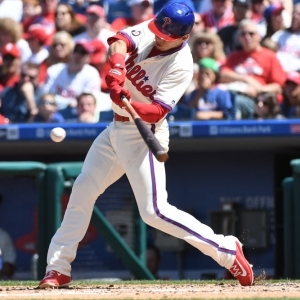 Aaron Altherr is hitting .288 this year and he has an on-base percentage of .359. He has totaled 78 hits and he has driven in 44 men in 271 at bats. His OPS+ is 134 while his slugging percentage is at .539. The Phillies have 738 hits, including 159 doubles and 92 home runs. Philadelphia has walked 264 times so far this season and they have struck out 780 times as a unit. They have left 577 men on base and have a team OPS of .699. They score 3.83 runs per contest and have scored a total of 345 runs this year. Miami has a 41-49 overall mark this year. With an earned run average of 7.53, Adam Conley has a 2-3 record and a 1.57 WHIP. He has 23 strikeouts over the 28.2 innings he's pitched. He's also given up 29 hits. He allows 9.1 hits per nine innings and his FIP stands at 5.24. The bullpen has an earned run average of 4.06 and they have given up 325 base hits on the year. Teams are hitting .246 against the Marlins bullpen. Their relievers have struck out 332 batters and walked 151 opposing hitters. As a team, Miami allows 8.6 hits per nine innings while striking out 8 batters per nine innings. They are 22nd in the league in team earned run average at 4.63. The Marlins pitchers as a team have surrendered 762 base knocks and 411 earned runs this season. They have given up 100 home runs this year, which ranks 28th in Major League Baseball. Miami as a staff has walked 348 hitters and struck out 711 batters. They give up a walk 3.9 times per 9 innings while they strike out 8 per 9. Their team WHIP is 1.39 while their FIP as a staff is 4.44. As a team, they are batting .268, good for 4th in the league. The Marlins hold a .423 team slugging percentage and an on-base percentage of .327, which is good for 15th in baseball. They rank 3rd in MLB with 9.3 hits per contest. Marcell Ozuna comes into this matchup batting .317 with an OBP of .375. He has 111 hits this year along with 70 RBI in 350 AB's. He maintains a slugging percentage of .563 with an OPS+ of 147. Giancarlo Stanton is hitting .272 this season and he has an OBP of .357. He has collected 91 hits in 335 at bats while driving in 59 runs. He has an OPS+ of 141 and a slugging percentage of .561. The Marlins as a unit have 836 base hits, including 150 doubles and 104 homers. Miami has walked 241 times this year and they have struck out on 706 occasions. They have had 619 men left on base and have an OPS of .750. They have scored 4.63 runs per game and totaled 417 runs this season.